Andreas Tóth, the Online Sales Manager at Electrolux has worked for the company since November 2016, helping to grow the online sales and introduce a data driven culture with the help of Klipfolio dashboards. When asked about his role, Andreas tells us, “We are a completely new team at Electrolux, in charge of starting up 55 shops in 19 European countries. The stores were created to sell spare parts and accessories directly to consumers.” Andreas needed a way to track these new stores in the central Electrolux office and also share that data with each country, which is when he began his journey with Klipfolio. Electrolux is a Swedish multinational home appliance manufacturer, headquartered in Stockholm. It is consistently ranked the world’s second largest appliance maker by units sold and sells products under a wide variety of brand names, including its own. Electrolux was founded in 1919, selling vacuum cleaners in several European countries. Over the past 99 years, Electrolux has expanded operations and now sell a wide variety of products including refrigerators and dishwashers. They have grown significantly over the years and now employ over 50,000 employees worldwide. Before building dashboard with Klipfolio, the Electrolux team relied solely on Google Analytics to track and share all their data. The problem was, not everyone knew how to use Google Analytics and being able to find the exact data they were looking for was difficult. The team needed a simple to understand dashboard that each store and country could use to find their specific sales data. The Electrolux team was looking for a tool that could help monitor their daily sales and KPIs. And more than that, they needed a tool that would make it easy to share that sales data with teams around the world. The Electrolux team also finds the mobile app to be an extremely useful feature that helps them stay on top of their metrics no matter where they are in the world. The Electrolux team uses their dashboards in three different ways -- on TV monitors around their offices, on personal desktops when they want to dig into the data, and through the mobile app which gives them a good view into KPIs wherever they are. 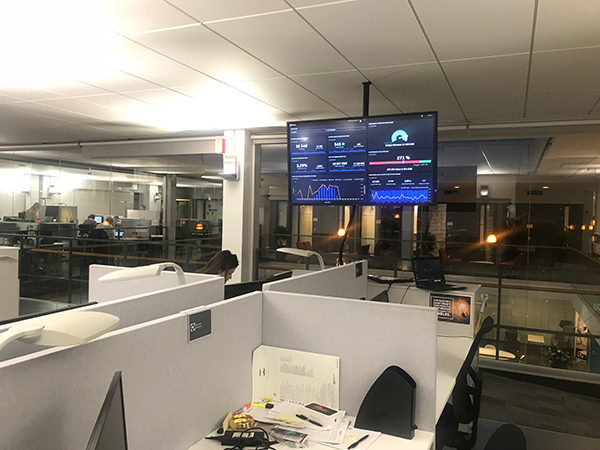 The central e-commerce team uses two TV monitors in their office to track their daily sales and performance, giving the team a real-time view into their KPIs. They also use their dashboard as the focal point in bi-weekly meetings to discuss their current performance and compare that to YoY data. As mentioned earlier, the ability to easily share data with different users, groups, and shops was a huge factor in the decision to move forward with Klipfolio. The local Electrolux shops have complete access to the dashboards so they can follow the sales for their specific brand and country. This helps to give the power of data and knowledge to everyone at Electrolux, helping the team make data driven decisions. These metrics help keep the sales team up-to-date on their performance and the overall performance of the company. With the help of Klipfolio, the Electrolux team is able to use their dashboards to react much faster when they see problems with sales or performance numbers at any of their shops. Catching problems before they affect sales numbers helps the company with their continued growth and success and allows them to celebrate big wins! Cheers to that! And cheers to helping Electrolux take over the spot as the world’s largest appliance maker.